These priceless words of a most remarkable philosopher\statesman, lead us to a basic conclusion: the future prospects for progress and prosperity of Individuals and Nations can quite precisely be predicted by its peoples prevailing attitudes towards their history. Three dates are of paramount importance in the history of the freedom struggle of the Muslims of the Subcontinent: 30th of Dec, the founding day of All India Muslim League, 23rd of March 1943 (now commemorated as Pakistan Day) and the 14th of August 1947, the day of success for the struggle studded with the best of human efforts and sacrifice. There cannot be any acceptable excuse in not preserving each and every moment of these days in our history. Unfortunately, as witnessed often in our daily chores, we are guilty of a neglect that we can ill afford. This pertains to the 23rd of March 1947. The attitudes of a society and of those responsible for making decisions are reflected in everything that its individuals do, in every decision that they make, particularly in issues pertaining to community welfare and development. The results of our day to day work also depend, to a very large extent, on these attitudes. In this background, we will bring to light an issue that for the writer is of great National importance. 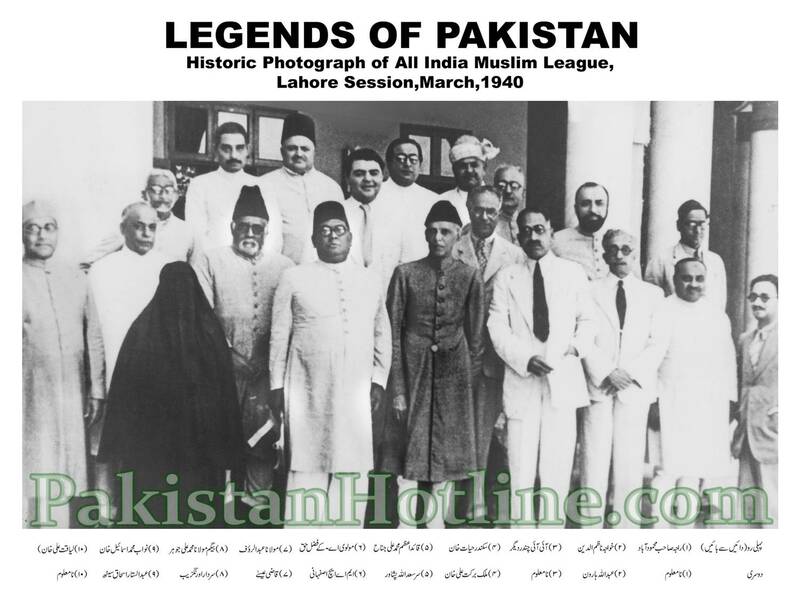 This official photograph, released by the Government of Pakistan, and conspicuously displayed in many official offices, is very appropriately and rightly labeled as Legends of Pakistan. It is displayed at the main door of the National Archives in Islamabad. It must have been approved by some “Competent Authority’’ and I believe would have been more than casually seen by all important “Leaders “of Pakistan. Perhaps the same casual attitude that prevails in the country as a whole was meted out to this National asset too. An immediate reaction in the mind of anyone looking at this photograph seriously , or perhaps just more than casually, is that the title “ legends of Pakistan ” in no way allows, the “legends of the Nation” to be called and labeled as unknown. This not only sounds like a crime against history, against our National struggle for Independence but it also betrays the title itself. In this day and age, not being able to find the identity of three people, (out of the 18 select group) considered worthy of being with the father of the Nation on the most significant and historic day in the history of our struggle, is certainly not comprehendible. Not being able to identify these “Legends’, is not only difficult to digest it is rather unbelievable and unpardonable. It in reality reflects the attitude and lack of dedication that we all have as a nation, towards serious work. Though this poor attitude reflects every day in our daily activities, yet in such a serious matter it speaks volumes against those responsible for this project. The desire to know the truth, determines, to a very large extent the way we live and spend our lives. This in turn determines the attention given to detail and the correctness of our decisions. There are countless examples where, our poor behaviors depict a clear lack of application of sound thinking and an extremely non serious attitude. We are guilty of not only being unable to look into the past, but also of not appreciating the present. The chances of planning correctly for the future are obviously non existent. Just to quote a few issues, some of which are of the greatest importance even for our survival are the victims of such casual behaviour. We are a country with water scarcity and our biggest asset is the sub soil water. When I see this precious commodity being pumped out to wash cars, and roads and to irrigate decorative plants, even within a hundred feet of the Canal, it reflects very clearly our attitudes. The mess on the roads , the poorly designed towns and cities, the jigsaw puzzle like power cables, the total disregard for safety at all work places. Our attitudes need a radical change and that can only, come through continued and dedicated efforts of the Leaders, we need real leaders, who are men of substance.